We are the Hawaii timeshare resale experts! If you do not find what you are looking for, please contact us and we will find the right timeshare for you. 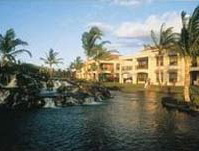 The Bay Club at Waikoloa Beach Resort is located on the Kohala coast on the Big Island of Hawaii. The resort offers you the ultimate island lifestyle, with waterfalls and tropical garden pathways throughout. The resort is strolling distance to championship golf courses and the white sands of the Anaeho'omalu Bay. The resort also offers an outdoor pool and two championship tennis courts. For your dining enjoyment, the area boasts more than 30 restaurants and lounges. Sell your timeshare quickly with All Island Timeshare Resales. Buy a timeshare quickly with All Island Timeshare Resales. View our new timeshare listings and the best buys we have to offer. View interactive geographical maps of timeshare resorts by island. See what clients have to say about All IslandsTimeshare Resales. Copyright© 1996 - 2018 All Island Timeshare Resales (AITR). All rights reserved.